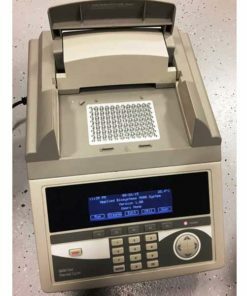 The Eppendorf Mastercycler nexus flat thermal cycler is non gradient thermal cycler with an aluminum thermal block and 4 slide or equivalent capacity. With a 4-99°C temperature control range, the Mastercycler nexus flats thermal cycler is a fast, safe thermal cycler. Eppendorf Mastercyler nexus flat thermal cycler models use up to 4 slides or equivalent instead of tubes to store sample capacities. The Eppendorf Mastercycler nexus flat uses peltier elements and triple circuit technology to heat the lid to a range of 37-110°C. The lid also features Eppendorf flex lid technology for ergonomic lid opening. Block homogeneity ranges from 20-72°C < ±0.3°C, 95°C < ±0.4°C with an accuracy of ≤ ±0.2°C. The Eppendorf Mastercycler nexus flat thermal cycler has an approximate heating rate of 3°C per second and a cooling rate of 2°C and features USB, Ethernet and CAN in/out interfaces. All Eppendorf nexus thermal cyclers feature low power consumption using only 700W during operation. Control up to three cyclers using either a nexus or nexus gradient as the control cycler, controlling up to two nexus eco cyclers.